I'm still on this gluten free thing and feeling a lot better for it. That's not to stay I stick to it 100% – I find it impossible to resist when I'm eating out. But thankfully the effects for me aren't too severe so that's a trade off I can happily make, I know not everyone can do this! I found out about Amo Torta through this blog as they got in touch with me when I previously posted about going gluten free. I had the pleasure of sampling the baking recently and wanted to share it with you all. Firstly, what does Amo Torta mean? In Italian, it means I love cake! This is such a super cute name, I think it's a really sweet name. Amo Torta is based in Glasgow and you can get in touch to order their cakes, or pop into Roots & Fruits who are stocking some of the cakes! We sampled some cupcakes, millionaire shortbread as well as lemon poppyseed cake. (Yes, I know they're on a cheeseboard!) What a beautiful feast for the eyes these were, especially those cupcakes. The decoration reminded me of being a kid again as I used to think those silver decorative balls were the height of sophistication when I was about 7. There was also pieces of something I think was jewelled sugar which looked great. The cupcake based itself was plain with the delicious pink vanilla-flavoured icing. I don't think to a non-GF eater that you'd know they were GF, they had the perfect flavour and consistency for a cupcake. The millionaire shortbread was another treat which didn't lose any flavour for being GF. Topped with chocolate and caramel these are really decadent and best consumed with a cup of tea! My favourite though was the lemon poppyseed cake - moist and with delicious lemon icing with a tangy punch, this is my kind of dessert. They also do dairy free and some low sugar cakes (will definitely get those next time!) as well as celebration cakes. 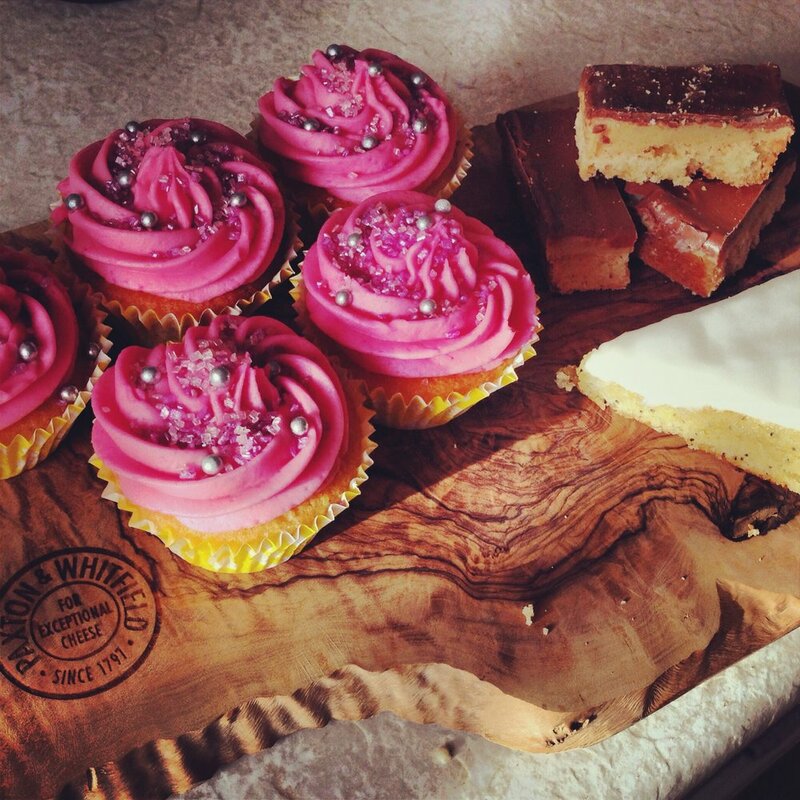 What cakes are you getting stuck into this winter?